In the wake of the Democratic Party's Tuesday defeats, a progressive group acting to reshape the party is warning leaders to avoid "another billion-dollar blunder" by abandoning attempts to win over white working-class voters and stop taking black voters for granted. Democracy in Color, which hosted a forum earlier this year for candidates vying to take the reins of the Democratic National Committee, put out a new report on Thursday morning urging the party to reject "conventional wisdom" that suggests it needs to win over people that voted for President Donald Trump in 2016. "Democrats and progressives are once again at risk of replicating their billion-dollar blunder by squandering precious time and resources chasing voters who backed Trump," writes the group, which recommends allocating money towards turning out minority voters. "Democrats didn't lose because white working class voters defected to Trump," said Steve Phillips, the group's founder. "Democrats lost because of lower Black voter turnout and Obama voters defecting to Jill Stein and other third- and fourth-party candidates." 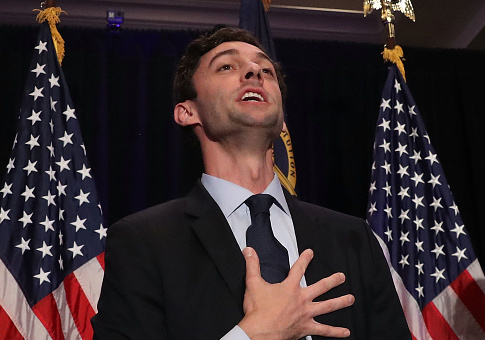 The report comes two days after Georgia Democrat Jon Ossoff, who ran as a centrist and openly courted Republican voters, was defeated by Republican Karen Handel despite spending nearly $30 million on the race. Phillips, a fellow at the Center for American Progress, wrote earlier this week on Democracy in Color's website that "every dollar" Ossoff "spent wooing Republicans is money flushed down the drain." "As the election approached, Jon Ossoff’s campaign increasingly moved to the middle in a vain attempt to attract Republican support in the hopes moderate Republicans would be appalled by Trump’s behavior," he wrote. "This was the same approach tried by the Clinton campaign which focused on his temperament instead of his racism, sexism, and xenophobia." Phillips writes that Ossoff would have been better served ignoring Republican voters, who he says cannot be convinced due to factors such as "racial solidarity." "When people show you who they are, believe them," Phillips wrote. "For whatever reason — racial solidarity, cultural anxiety, willing suspension of disbelief, or something else — so-called moderate Republicans are sticking with their man in the White House." Democracy in Color recommends that the party put an end to campaigns such as Ossoff's, which focused on his pledge to work across the aisle and championed conservative issues such as government waste. Instead it recommends that candidates focus on painting Republicans as "racist, xenophobic, homophobic, and sexist," attempting to impeach Trump as a way "to define the 2018 contests and put everyone on record," and to push bold policy positions such as a wealth tax and free college. The Democratic Party has been forced to scramble in search of a message following its Tuesday night defeats in both Georgia and South Carolina. The party has now lost four elections since it lost both the presidency and control of the Senate last November. This entry was posted in Politics and tagged Democratic Party, Election, Jon Ossoff. Bookmark the permalink.